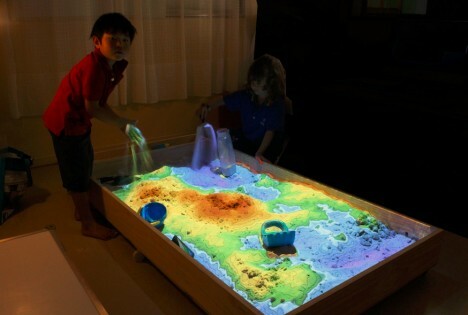 Simulating an amazing array of natural environments and phenomena, this dynamic playspace turns ordinary hand-sculpted sand into vividly colorful landscapes in the blink of an eye. 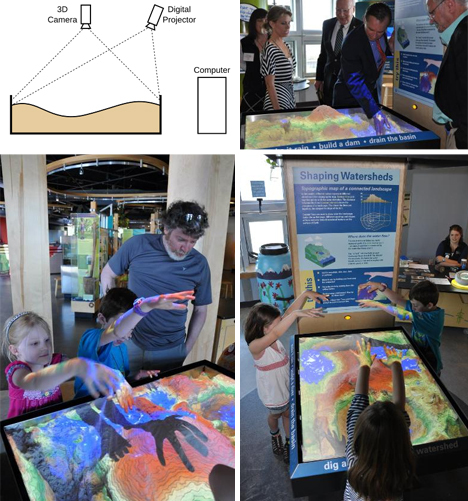 A real and working augmented reality sandbox, the system is designed to help educate students about earth sciences with a uniquely responsive and intuitive interface. A team of data visualization and earth sciences experts, mainly from the University of California, created the setup using a Microsoft Kinect camera coupled with topographic visualization software and a 3D data projector. From rough prototypes to its present state, the project has come a long way in terms of the level of rendering detail and response speed. Of course, one can imagine an array of applications of this technology beyond classrooms and science museums, from Minecraft-style, construction-centric games to simulators and modeling tools for landscape architects and urban designers.